You are here: Home / Coping / Are Doctors Biased Against Patients? 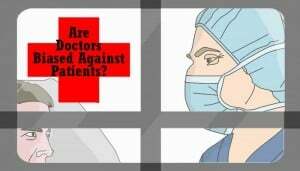 A new survey from Medscape asks the question: Are Doctors Biased Against Patients? And if so, does it affect the treatment they provide. Short answer, Um yeah. They are. I didn’t need a survey from Medscape to tell me that. However, it is interesting to see the many ways that doctors are biased against us. I shared a study a while back that showed that many doctors are biased against patients with Fibromyalgia. Biased might not be the right word there, as what it really came down to was that many doctors are just plain scared to treat us, or simply they don’t want to treat us because they don’t feel they can help us. I can give the latter group a bit of a pass. I mean, really, who wants to do anything when they feel they aren’t getting anywhere. If I were a doctor that didn’t have any good answers for Fibromyalgia (or any illness) I’d refer those patients out to someone who I hoped had better answers. But, what about this bias survey? Almost 16,000 doctors filled out the survey from Medscape, which examined two factors: bias and burnout. Regarding the burnout statistics the interesting finding is that Rheumatologists (the specialists that most commonly treat Fibro) reported the lowest levels of burnout, along with Psychologists. That’s good news for us. I guess that means that those doctors who have chosen to deal with us are dealing well with their role. When asked about the causes of their burnout, bureaucracy (in many forms) lead the pack, sadly followed by “too many difficult patients”. A frequent comment had to do with lack of patient appreciation and respect (I do hope they know it’s a two-way street). Are we those difficult patients? What is a difficult patient? And, what can we do about it? (Interesting questions for a future blog post). 40% of the doctors surveyed admitted to having some sort of bias towards specific groups of patients. The more that a specialty had direct interaction with patients the more likely they were to report a bias. Because this study is asking for personal report from the doctors it can only report conscious biases, so there may be unconscious (or implicit) biases that also affect their interactions. Only a small percentage of the doctors in this survey reported that their biases affected the treatment they give. I have a feeling this is likely where the doctors weren’t being completely honest. It’s one thing to admit to a bias, it’s another thing to admit that it actually affects the level of care that you give. Interestingly, of the doctors who reported that their bias affects treatment, 25% said that they actually give better treatment to those who they are biased against because they overcompensate for their bias. The doctors most likely to admit that bias affects the treatment they give came from doctors who work in the ER (14%). If you’ve ever been to the ER you’ve probably seen this in action… and I doubt you’d say it had a positive outcome. Emotional Problems were the #1 reported bias from doctors. If this isn’t a reminder to keep your emotions in check at the doctor’s office, I don’t know what is. If there’s ever a time to make sure you don’t cry it’s when you are facing a doctor. I’ve broken down in a doctor’s office a time or two and I can honestly say that doing so really let me know who that doctor was. The sad part is that many doctors do view any break as an emotional problem. It doesn’t matter how much pain we are in, to many of the doctors we are weak if we can’t keep our emotions in check. Weight came in second. I find this humorous given the number of medical professionals I’ve met who are grossly overweight. Perhaps it’s only the fit ones that judge their patients based on weight, but I doubt it. More male doctors than females reported this as a bias. At least they are aware, but you’d think that as doctors they’d also be aware that it’s not always within the patient’s control. Interestingly, doctors were most likely to report that these two biases resulted in a negative treatment. Which doctors are more likely to be biased? Younger doctors (under 45) were less likely to report that their bias resulted in negative treatment, saying that they were more likely to overcompensate. Older doctors were much likely to report that their bias resulted in negative treatment. Doctors who were born in the US report greater levels of bias than those who came to the US as adults, with those who came to the US as children falling in the middle. Overall, this was an interesting survey. It’s worth taking a look at the full survey results as there were a few other (unrelated) questions that I didn’t cover, including questions about marijuana use and prescribing habits. Another thing that I found missing from this survey, and I don’t know if it was because they didn’t ask for because the doctors didn’t respond was a bias against patients using paid medication, or a bias against pain patients in general. This is a bias it seems that many of us have encountered and one that is often discussed, yet there was no mention of it here. Have you encountered a doctor who was biased against you for some reason? Do you know what their bias was? Or, do you think you know? Excellent article, Julie! I have been to many, many doctors. Since I was in good shape physically and they couldn’t find anything “wrong”, besides the pain, fatigue and the symptoms that go with Fibro a lot of them just thought I wanted drugs. This was of course the opposite of the truth. I despise taking drugs, I wish I never had to take another one. BUT, I’m thankful for them. Necessary evil I guess. I have had the same problem with Pharmacists being biased. They see how much medication I take and Bam! I’m a drug addict. I’ve even had Pharmacists not filling prescriptions just because they wanted to talk to the doctor first, just because. This has happened several times. Doctors, Pharmacists, bias? Uh, yeah.